According to the report published by the independent age and the International Longevity Centre UK (ILC-UK) states failure to attract the British workers to care sector and also Tier 2 visa restrictions contribute crippling of the adult social care sector. Within 20 years, the sector does face a potential shortfall of one million workers, the report added. 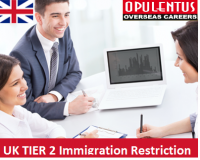 The ILC UK has stated that Tier 2 immigration restriction should be relaxed to allow care homes to recruit more staff from overseas. Also, we find more funds needs to be provided to enable higher salaries to be paid and to retain those already employed in the UK in the care sector. Simon Bottery, the director of Policy at independent age said, Non-action would lead to a decline in quality care services. Mr Bottery went ahead to state that; social care is presently reliant on Tier 2 immigration system that enable’s recruitment of foreign worker and that the process of bringing staff to the United Kingdom from overseas needs to be simplified. However, he also acknowledged that other steps also required to be taken inorder to measure that there are enough workers in the social care sector in the long term. The govt should use the upcoming Spending review as an opportunity to invest in social care. Mr Bottery suggested, this might enable the sector to attract more number of British workers additionally offer an opportunity to explore a new way to provide care for the aging population in the future. Presently, nearing to 1.45 million people are employed across the adult social care sector in England. The ILC –UK report does state that the nation is facing difficulties in recruiting and retaining the staff, across the industry. Of the total, existing adult social care positions in England, one in 20, we find it to be vacant. The report does stress that lack of staff is not the only factor to contribute to pressure; the adult social care sector faces. A rapidly ageing population would lead to increased demand for carer services, combined with massive cuts to social care funding does mean that the outlook is bleak unless radical changes have been made.